Ready for next year's winter breakfast at 90% off. Now that is my kind of shopping! Score for you!! Where did you find them and what kind of fabric are they? Where do you store all your out of season finds until the next year? I really don't stock up after holidays like some people do. Christmas would be the only exception--and I don't keep any decorations like garland or wreaths. I do stock up on consumable items like tissue paper, generic gift wrap, etc. I have a cabinet above the dryer that holds this stuff. However I KNOW I will need tablecloths for the breakfast next year and these are the right color. 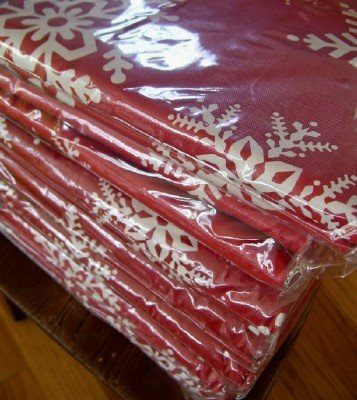 35-cents for extra-long tablecloths seemed worth the storage. I will probably store them between platters in the china cabinet. They are from Dollar General, where all Christmas went 90% off this week. For 35 cents, they must be either paper or plastic, right? Somehow I have a hard time imagining your using paper or plastic tablecloths when entertaining. What a find! Definitely worth the storage. Love your blog and your photos. Your posts are always short and perfectly to the point. It's always a joy to stop by. Wonderful steal! I love when I fall into finds like that. Our big holiday is Thanksgiving, so I do that with T-gving & harvest stuff. You rock! I'd place them somewhere "safe" and then lose them by August. One of these days I'll get it together! THanks for the inspiaration in the mean time! Why do some people have to be so passive aggressive? I mean, it's a simple morning breakfast with tablecloths (does it really matter that it's plastic or paper?, it's the thought behind the action that counts). Hello, she doesn't have to do any of it but is gracious to do so. It's pretty sad when someone needs to make themselves feel better by trying to make someone else feel bad. I have family that does this, so please don't try to say you weren't doing it. Great find! Kind of takes some of the pressure off already, doesn't it? I love decorating with red. Oh, I LIKE it! 90% off is the best! Fantastic find! I do the same thing, shop after whatever holiday for the next year. Those will be so pretty at next year's Christmas breakfast! Oooh, you are making me want to go shopping. How nice to know that detail is taken care of for next year, and the motif will work for December or January. good job, girl. you do exactly what i do! i agree, it's not neccesarily stocking up - it's just keeping a keen eye open!